The Beck 11-yd. Interstate Class mixer bears on a Mack Granite with set forward axle; MP7-395C engine rated at 375 hp and 1,560 lb.-ft. torque; and, mDRIVE HD 14-speed, ultra-low creeper/multi-speed reverse transmission. The Con-Tech 11-yd. BridgeKing bears on a Kenworth T880S with set forward axle; Paccar MX 11 engine rated at 430 hp and 1,650 lb.-ft. torque; and, Allison 4700 7-speed automatic transmission. The first truck is a Beck 11-yd. Interstate Class Vortex paving mixer mounted on a 2019 Mack Granite Bridge Formula GR64F. “We believe in this program and we see proof as every year, more CIM graduates assume leadership roles in the industry,” says Frank Beck, partner at Texas-based Beck Industrial. The CIM Auction pool spans concrete production and construction equipment, tools, materials and technology products, plus travel, entertainment and sports event packages. The January 23 schedule calls for a silent auction on select items, 11 a.m. to 12:45 p.m., followed by live bidding—on site or online—under the direction of Ritchie Bros. auctioneers. A full list of auction offerings is posted at www.concretedegree.com/auction. “We have the potential for our greatest auction ever,” says CIM National Steering Committee Executive Director Eugene Martineau, who in addition to Beck Industrial, Con-Tech, Kenworth and Mack credits the auction’s sustained success to other major, perennial CIM Auction donors and supporters—among them Richie Bros. and World of Concrete show management, Cemex USA, Command Alkon, LafargeHolcim, Lehigh Hanson and Somero Enterprises. The Committee directs proceeds to four-year degree CIM programs at Middle Tennessee State University, Murfreesboro; New Jersey Institute of Technology, Newark; Texas State University, San Marcos; and, California State University, Chico. 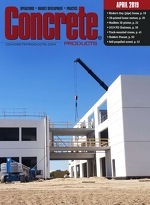 The recently developed Graduate Development Program at Command Alkon, Birmingham, Ala., provides Middle Tennessee State University (MTSU) School of Concrete and Construction Management graduates an opportunity to gain real-world industry experience, rendering a workforce that is qualified to fill in the gaps caused by the labor shortage. While thousands of construction jobs are added each month, industry recruiting has been burdened by the fact that relatively few colleges and universities counsel and equip students to consider high-paying construction careers. The MTSU School of Concrete and Construction Management’s Concrete Industry Management Program is designed to combat the anticipated shortage of managers needed to support projected business growth. Command Alkon has fostered a close relationship with the CIM Program patrons and National Steering Committee over the years, and developed a program designed to arm students with the skills and insight they need to succeed. The 24-month Graduate Development Program launched in 2018. For the first 18 months, students rotate between different departments to get a flavor for the contributions that each team makes to Command Alkon and the industry as a whole. Students will ultimately choose an area of the company where they feel they can thrive for the last six months of the program. More Graduate Development details can be obtained from Michael Wolfe, [email protected].